Mrs. Toddy Donahue's Lemon Cake is one of our best and favorite cakes and sounds so delicious right now with a hot cup of freshly ground blackberry creme coffee right? 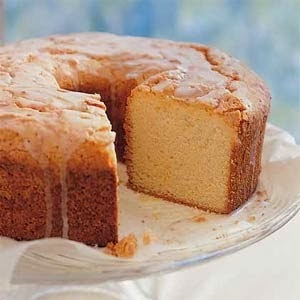 Have you made this lemon pound cake? It is divine and hits the spot this time of year..the most important ingredient? The little jar of bright lemon curd in our kitchen I promise you will not be disappointed! Easy Easy! 1. Preheat oven to 350 degrees F. Add cake mix and instant pudding to electric mixer bowl. In a measuring cup, add the lemon juice and cold water to make 2/3 cup. Add the eggs, lemon water and lemon extract to the dry ingredients and stir to blend. Pour in the oil and beat at medium speed for 6 minutes, or until very smooth. 2. Take 1/3 cup of the batter and set aside. Pour remaining batter into a lightly oiled Bundt pan that has been sprinkled with sugar. Mix the reserved 1/3 cup of batter with the whole jar of lemon curd. Make a tunnel-like well through the batter in the Bundt pan and fill it with the batter - Lemon Curd mixture. Bake for about 50-60 minutes, until the top is golden and a toothpick inserted in cake comes out clean. 3. When the cake is done, let it cool on a rack, and then invert onto a plate. Sprinkle with confectioner's sugar and grated lemon peel and serve with a little Lemon Curd drizzled over if desired. Or glaze with the following: Combine 1/4 cup lemon juice, 1 teaspoon grated lemon zest, 1/2 teaspoon lemon extract, 1 cup confectioner's sugar. Pierce cake with a skewer all over the top and drizzle glaze over.